We have just released a new version of Icon Cast. Again it took longer than we wanted but we had some issues with releasing the Paddle version - alternative to Mac App Store. We gave up for the moment and will get back to this in 1.8. So Paddle users have to wait a bit longer this time for the enhancements. We are sorry guys! You can now browse all icons when you do not search. On top you will have always a few recently used icons. Below these you will see individual categories. After SVG this was actually the second most requested feature. So hopefully better late than never. Icon Cast always had a flexible color picker. It even accepts wild CSS input. In this release we have also added option to switch to material design color palette. 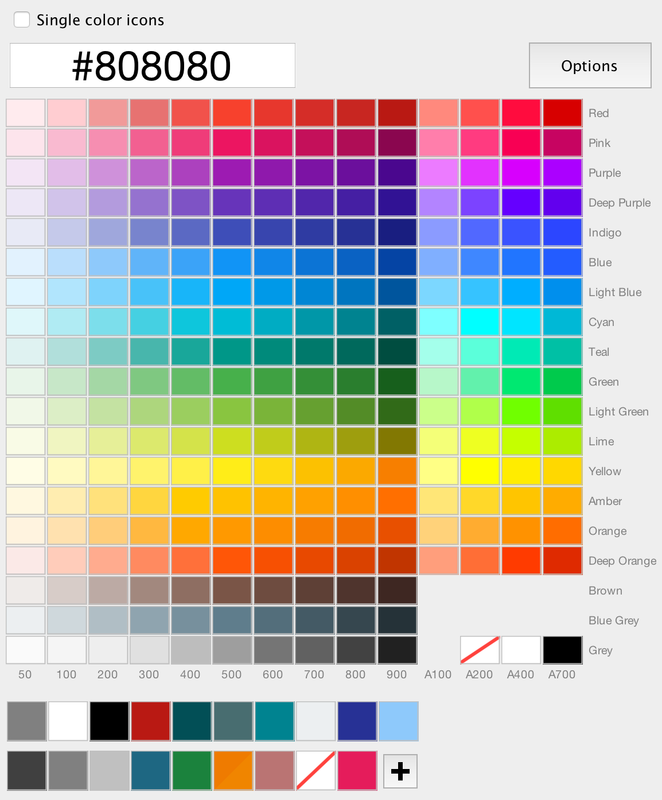 With growing popularity of Material Design in web and mobile it makes sense to have quick access to these colors. Google guys made a really good job on putting the colors together. You can very easily create icons in colors that look great together. Without having to fiddle with shades and hues yourself. The original color picker is still available and it is the default one. Use Options button to switch between pickers. Additionally to drag-and-drop, copy-paste and opening an icon in an external editor you can now also save icons directly from Icon Cast. No need for workarounds from now on. Apart from other minor improvements there are also new icons. See below. You can buy Icon Cast at Mac App Store or download a demo.